As I promised, here are some pictures of the projects we made over our Regency Sewing weekend back in January. Some friends of ours (and amazing seamstresses) invited us to come down to visit them and make regency dresses. We had to do it in two parts, so they first came up to our house for New Years and we made the proper undergarments - which would be rather improper for me to post pictures - and then a couple weeks later we made the dresses. It was such a fun way to spend the weekend, sewing and talking and fitting, and watching Persuasion, and having a tea party...bliss. We used Jennie Chancey's Elegant Lady's Closet pattern, though made several alterations to make it fit right. I would have posted these sooner, but we only just got the official photos, since we had to finish them at home (just the last few touches, like hemming, and button holes, etc). Enjoy! This is my sweet sister - she made a gathered bodice with a squared neck, small waistband and 1/2-length sleeves. A fun angle of the buttons and pleats! So pretty! Isn't it beautiful? And I think the green really suits her, don't you? Mine is a bib-front dress, which opens in the front (the front flips down) and has ties in the back - almost like an apron which is attached to the skirt. The front closes with two buttons in the corners, there is a small waist band and the skirt is pleated. One of the buttons which holds the front piece up - yes, I did make those dorset buttons and they are a very fun project! The back ties and pleats. 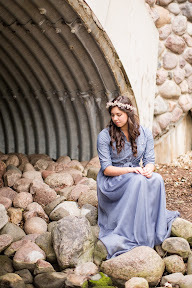 This was probably my favorite photo from the photo shoot! Many many many thanks go to Lily and Mrs. R for their expertise at sewing and for helping us with these dresses - they wouldn't have turned out half as great if they hadn't helped us! Oh you girls look simply beautiful! The detail on your regency dresses is amazing. I love, love, love your buttons Tara! They look so feminine! You gave me a laugh about the undergarments! If/when we are over at your house again I want to see how you made them! Glad you girls had fun! :) And great job on the dresses! Glad you liked them... I do too! *winks* Tee hee, sure I guess I could show you the undergarments in the privacy of my home! They both look VERY nice! You two did such a good job with keeping things even and looking good. Weren't the buttons fun to make, Tara? Yes, another sewing weekend (or two) is in order. Mid-May, perhaps? M. Mari - Thanks for the comment! Glad you liked them! Mrs. R - Oh yes, I am quite hooked on Dorset buttons! They went a lot faster than I first thought, and the end product is so cute! Did you alter the pattern yourself to make the bib front? I love all your creations! My friend, Lily from Mode-de-Lis, helped me alter the pattern for the bib front. I can look up the exact dimensions for the bib front piece, if you'd like!